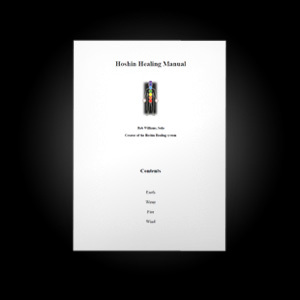 The Hoshin Healing system was created by Sensei Williams at the request of our founder, Dr. Glenn Morris. In order to achieve the rank of Sandan (3rd degree black belt) one must earn certification in the Hoshin Healing system. Although the healing system is integrated into the belt levels and taught through your instructor, it is also available to ryu members and the public at any point in time for advanced study and Hoshin Healer certification. The Earth Healing DVD contains instruction in relaxation massage as well as a 5 minute self-acupressure workout designed to reduce stress and restore balance to the mind, body and spirit. The Water Healing DVD contains instruction in therapeutic massage and posture analysis. The Fire & Wind I Healing DVD contains instruction in advanced bodywork and energy healing. The Fire & Wind II Healing DVD contains a complete healing session. 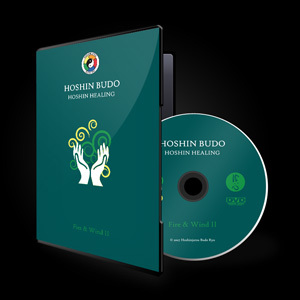 A broad range of healing techniques for self and others are presented in the Hoshin Healing Manual. Available in PDF e-book. All four DVDs plus the Hoshin Healing Manual for a discounted price.